Rather than post a particular prayer practice this week, I want to highlight some resources that you might find helpful as you think about the upcoming Lenten season. 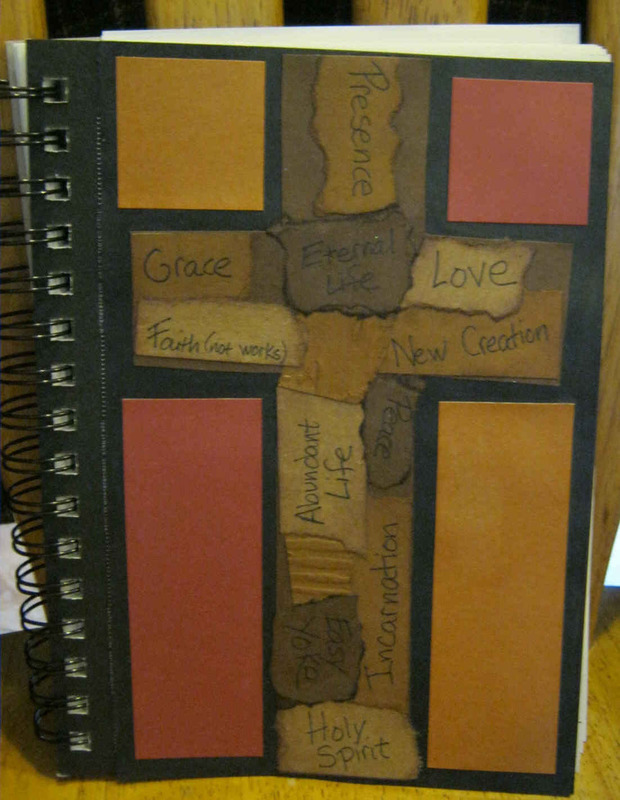 This is my prayer journal from the Holy Spaces retreat. Wilderness Choices: The Way of Jesus in a World of Worry; this is an actual, in-person, retreat at the Hollis Renewal Center in Bonner Springs Kansas, March 8-9. Holy Spaces: A Creative Arts Lenten Retreat; this material is based on the lectionary readings for 2012 (Year B), but the general Lenten themes carry over from year to year. The PDF book contains worship liturgies, creative prayer experiences, creative writing exercises, and scripture reflections. Fruit of the Spirit: A Creative Arts Retreat in Daily Life; this material contains 9 weeks worth of creative reflections based on the nine fruits of the Spirit listed in Galatians. The book is available with or without art supplies and also as a PDF. Colored Pencil Prayers; this book describes five different types of creative prayer exercises and provides prompts and drawing space for each. This blog; I will continue to post prayer practices, worship pieces, and scripture reflections throughout Lent. You can also select “Practices” on the Category list to the right–that will bring up previous posts that are specifically related to different spiritual practices. Practicing Families; I am on the leadership team of this blog which officially launches on February 11–the week that Lent begins. Each Monday we will post a family liturgy for the week. It will be a great resource for observing Lent with children. Creative Flourishing in the Heart of the Desert: A Lenten Online Retreat with St. Hildegard of Bingen; this retreat is offered by Christine Valters Paintner through Abbey of the Arts. Return: An Online Journey into Lent & Easter; this retreat is offered by Jan Richardson. Please share some of your favorite Lenten resources in the comments section below.